York, it will amaze you! 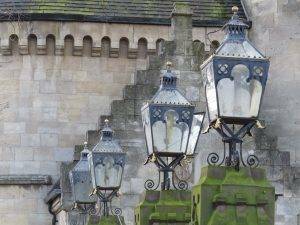 York is the country’s best preserved medieval city, and there is something of interest at every turn; the ‘typical time’ given would suppose you are not detained by anything, it will almost inevitably take two or three times as long! Quirky Shopping The biggest concentration of independent shops I have seen anywhere! Stonegate, Little Stonegate, The Market, the Shambles to name a few. Listed Building Entries: 1,586, of which 71 Grade I, 170 Grade II*. 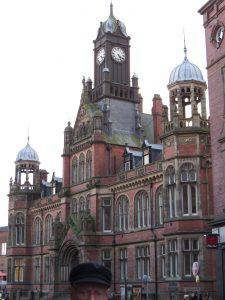 Some of these listings include several buildings in a terraced street for example. 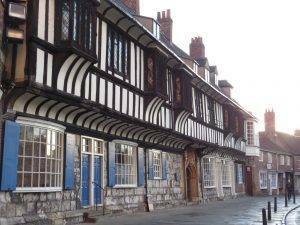 Therefore, there are over 2,000 individual listed buildings in York. York sits at the confluence of the rivers Ouse and Foss in the Yorkshire Vale, at a strategically important point with access to the sea, and is very prone to flooding. 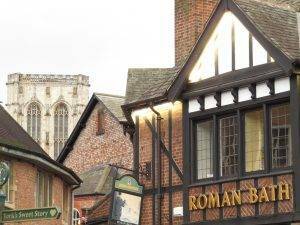 It was first founded by the Romans as Eboracum in 71 AD, and later became a stronghold of William the Conqueror, who dammed the River Foss and built a castle here. In the Middle Ages, the city grew as a major wool trading centre and became the capital of the northern ecclesiastical province of the Church of England. In the 19th century, it became a hub of the railway network and a confectionery manufacturing centre. But in recent decades, the economy has shifted towards services. The University of York and health services have become major employers, whilst tourism now accounts for over 10% of employment. 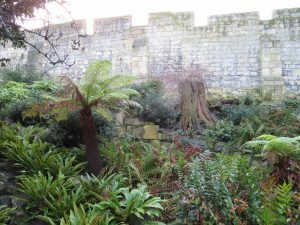 The walls, the most intact set of city walls in the country, have always defined York, but have had their ups and downs. 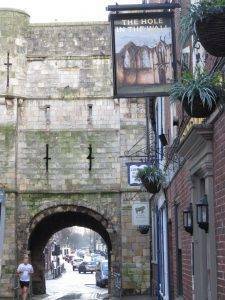 In medieval times, they were key to the defence of the city, in the 19th century they were regarded by the council as a barrier to economic growth, whilst in the 20th century, they became key to York’s popularity as a tourist destination, a role they still firmly retain today. 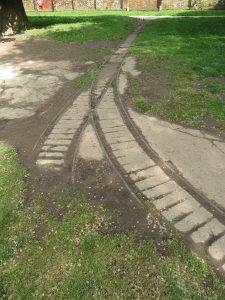 But the walls also undoubtedly represent York’s biggest topographical challenge, creating a disconnect between the city within and the suburbs without. This was exacerbated by the Highways Authority in the 1950s who decided to add a ‘concrete collar’ (aka the ring road) around the ‘stone collar’. One particularly ugly manifestation of this disconnectedness is the retail parks that have cropped up like a mushroom ring around these two circuits. A much grander plan, like most ‘grand’ urban plans, came to nothing. 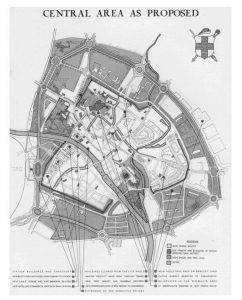 ‘York: A Plan for Progress and Preservation’, was published in 1948, that era of great hope for the future. The authors envisaged a dual carriageway set at an average distance of 250 yards outside the city walls; the intervening space was then to be developed as a ‘green belt’ with most existing buildings being demolished, the station moved further out and a small number of showpiece public buildings, such as schools, being erected in their place. Meanwhile, within the city walls, the problem was de-population. 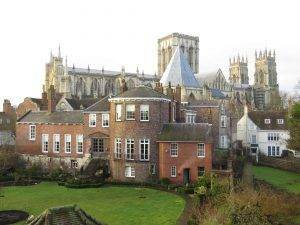 In the 1970s only 3,500 of York’s population lived within, compared to 10,000 in the Middle Ages. It has now once again exceeded that thanks to numerous housing projects, an initiative began by the far-sighted Lord Esher back in the 1960s, and an example to cities throughout the country as to how to re-populate city centres. Another feature of York we soon noticed is how buildings are used for one purpose and then another, switching through many uses during history. We stayed in a place that had been the Archbishop’s Palace, became a private residence and is now a hotel; we had coffee in a tower that was once a mortuary for bodies dragged from the river; we passed close to Bedern Hall, which started life in the 14th century as a dining hall for the vicars’ choral, then was turned into tenements, then a mineral-water factory, later absorbed into a pork-pie works, then splendidly restored! 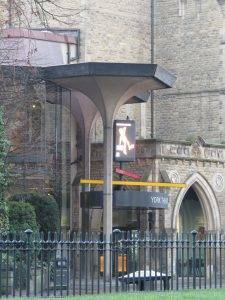 Or the Victoria Bar Apartments which, according to our lunch host, had variously been a Methodist Chapel, fire station, public library and are now serviced apartments. First of all, a confession. It took me a long while to come to York and devise an urban ramble. Everyone kept asking me “have you ‘done’ York yet, it’s so beautiful, it’s so historic, it’s a walkers’ city, the walls are amazing,” and so on and so forth. I thought to myself, it can’t possibly live up to all this hype. And yet I can now report that it does, and then some. To be honest it has been one of the hardest to construct urban rambles ever because there is SO much to see and it is so hard to make choices about what to include and what to leave out. The only other urban ramble as hard to construct had the exact opposite problem – a dearth of green spaces and interesting architecture that made it hard to find a good route at all (this city shall remain nameless). Coming out of York Station (1877), the Royal York Hotel looms large in front of us. It was built in 1878 as an integral part of the new (second) station and was managed directly by the railway company. York is very much a railway town. The railways saved York from stagnation. 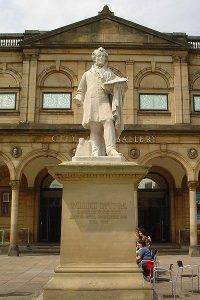 Crucially, York’s own ‘railway king’, George Hudson (local boy made good, then bad), convinced George Stephenson to build the line through York rather than bypassing it on the way to Leeds. 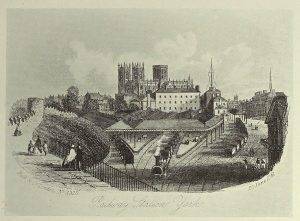 In 1840 the first train ran direct from York to London. By the 1850s, there were 13 trains a day between the two cities, carrying 341,000 passengers a year. By 1888 there were 294 trains arriving daily. The impact of the railways on York was dramatic. Tourism boomed: within two years of the first train steaming into York, excursions to the historic city were arriving from Manchester, Nottingham and London. 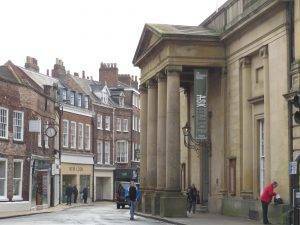 Theatregoers came from miles around to see productions at the Theatre Royal, rebuilt four times in the 19th century. Two Fine Art and Industrial exhibitions in 1860 and 1879, at York Art Gallery, attracted a total of nearly 870,000 people, demonstrating the new mass mobility of the railway age. The railways also brought heavy industry to the city for the first time. As we walk alongside the walls towards the centre, we spotted a few gravestones in the grassy bank. This is the site of the Cholera Burial Ground, where some of the 185 victims of the 1832 cholera plague were laid. At the time the medical establishment’s belief was still that diseases like cholera were caused by bad air (miasma). It was eventually recognised that the best way to combat cholera was to separate drinking water from sewage. 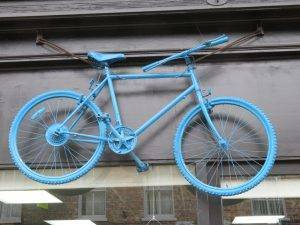 This discovery was made by John Snow (1813-1858), considered one of the founders of epidemiology, who happened to have been born only a few hundred yards away on North Street. We cross the road just to the right of the Leeman Statue, another famous York railway man, who also played a major role in the investigations into illegal share dealings which led to the downfall of George Hudson, a bitter political rival. had managed to locate so centrally by persuading the council to allow the walls to be breached by two neo-Tudor arches to allow trains access to the station. But it turned out to be redundant fairly soon as locomotives had to be reversed back onto the mainline which was very time consuming and created a bottleneck. The large Edwardian Queen Anne-style building to the left of the old station is the former HQ of the North Eastern Railway. It was built in 1900-6 by in-house architects William Bell and Horace Field, at a time when the company controlled nearly 5,000 miles of railways lines and was at the height of its powers. This is reflected in the quality and opulence of the building, which is now naturally enough a 5* hotel, The Grand. 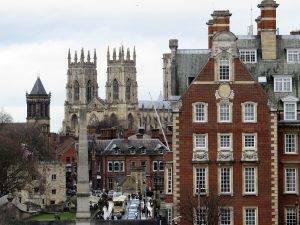 At last, clambering up some steep steps, we are on the walls and a great view opens up almost immediately of York Minster and the distinctive York skyline of myriad roofs and chimneys. 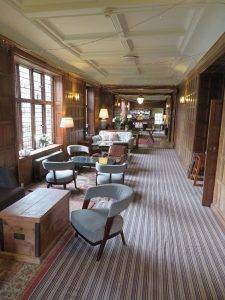 Although we had really only just started our walk, we couldn’t resist the café at the Barker Tower , it looked so inviting and indeed it was when we went inside and relaxed on their old sofa. In fact, we felt so relaxed we got chatting to the proprietor – only to find out that the building used to be used as a mortuary for bodies pulled out of the Ouse. We decided to push on before we became too relaxed and rigor mortis set in. Yorkshire House (1965), previously the Aviva Building, on the corner of Rougier Street and Station Rise, is that fairly rare thing in York, a successful modern building. It is faced in local magnesian limestone which gives it a classic simplicity. It is now being converted into luxury apartments and a hotel. Next up is a still more recent building, Aviva Tanner’s Moat (1993), also faced with magnesian limestone but neo-vernacular in style with historically derived details e.g. the mullion and transom window surrounds. This building stands where the old Rowntree factory was before it moved to Haxby Road in 1906. Employing 13,000 staff members here at the start of the twentieth century, Rowntree’s was often referred to as a ‘village within a village’. So, there you have it, in a nutshell, a story of economic transition – a railway headquarters becoming a luxury hotel and an industrial site becoming a services company, part of it now, in turn, giving way to tourism and lifestyle. The delightful Victorian Gothic Lendal Bridge was opened in 1863 to provide easy access to the city centre from the station, putting the centuries-old ferry service out of business at a stroke. The architect was Thomas Page, who also designed Skeldergate Bridge that we walk across later and Westminster Bridge in London. 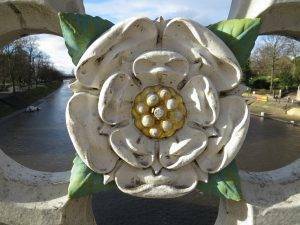 The ornate parapet of the bridge features the white rose of York, the crossed keys of the Diocese of York and the lions of England. Lendal Tower, just on the north side of the bridge, dates back to about 1300. It was originally part of the City’s defences. In medieval times a great iron chain which was stored in the tower was pulled across the river to Barker Tower on the opposite bank. The chain was a barrier to boats on the river, protecting the city in times of trouble and enabling tolls to be charged for entry. The Museum Gardens (4 hectares, 10 acres) are a splendid place to relax. 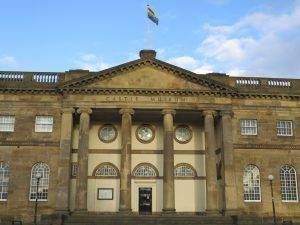 They were created in the 1830s by the Yorkshire Philosophical Society along with the Yorkshire Museum which they contain. They were designed as botanical gardens in a gardenesque style by landscape architect Sir John Murray Naysmith. In the summer, they are York office workers’ outdoor lunch spot of choice. The gardens also contain several buildings dating back to the medieval period, most of them relating to St Mary’s Abbey, founded in 1086. 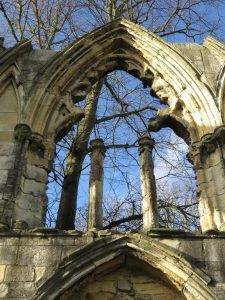 The abbey became the wealthiest monastery in the North of England before it was dissolved by Henry VIII in 1539. 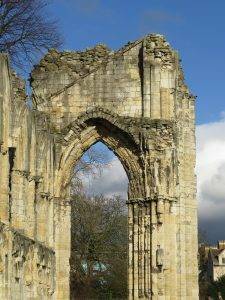 Over the next 200 years, the abbey fell into disrepair and the abbey church was largely dismantled for its stone. The Hospitium is thought to have originally been a guest house for visitors to the abbey of low social rank, or possibly a barn. 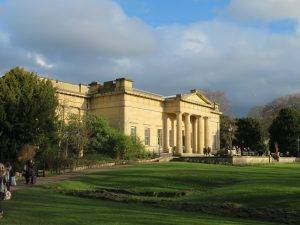 The Yorkshire Philosophical Society constructed several buildings in the gardens during the 19th and early 20th centuries, including the Yorkshire Museum, one of the first purpose-built museums in Britain, designed by architect William Wilkins in a Greek Revival style and opened in 1830. 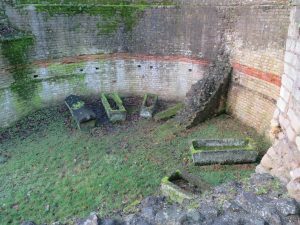 In the northeast corner of the gardens, we come across The Multangular Tower, the remains of the west corner of the fortifications that surrounded the Roman fort of Eboracum. The original defences, consisting of turf ramparts on a wood foundation, were built by the 9th Legion between 71 & 74 AD. 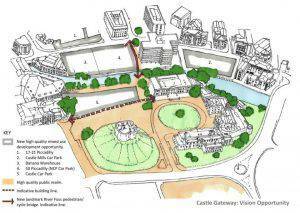 Our path comes out in Exhibition Square, the Etty statue and the York Art Gallery. The gallery opened its doors to the public in 1879 for the second Yorkshire Fine Art and Industrial Exhibition, inspired by the Great Exhibition in London of 1851. 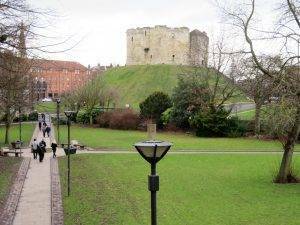 The history of how York’s walls were saved from destruction, then preserved and enhanced, is one of the original great conservation success stories of our country and the key to York’s stature today as one of the best preserved medieval cities in Europe – the walls have quite literally provided a protective cloak for what lies inside. The story runs something like this. At the start of the nineteenth century, the Corporation of York got a bad case of ‘the grass is greener on the other side of the walls’ syndrome. Other northern cities such as Leeds were starting to expand rapidly with the onset of the Industrial Revolution, whilst southern cities, notably Bath, were creating promenades and crescents to entertain the gentry and delight the eye. But York, they felt, was stuck in a rut, a medieval city utterly constrained by its walls and with squalid, slum conditions inside. The Council believed that ‘wholesale regeneration’ was desperately needed, in much the same way that city planners did after the Second World War (Birmingham, Bristol to name but two). 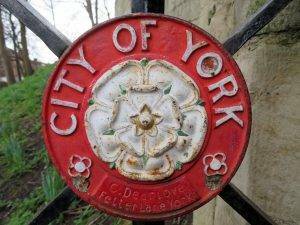 So, in 1800, the Corporation of York applied for an Act of Parliament to demolish them. 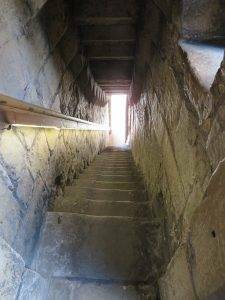 In addition to the poor condition of the walls at the time, the narrow gateways of the bars were inconvenient and the walls themselves hindered the city’s expansion. 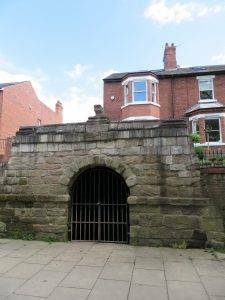 The gates had become a public health hazard given the number of locals using them as toilets, and theft of stone for other building works had left parts of the walls dangerously unstable. Furthermore, the Bars restricted stagecoaches, meaning York was unable to capitalise on its strategic position halfway along the lucrative London-Edinburgh route. 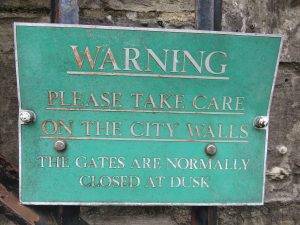 Besides, many other cities, including London, were removing their outdated, medieval city walls at this time. My hometown, Stamford, is fairly typical, the walls almost all falling into disrepair once the town started to expand into the newly enclosed fields. The Corporation informed Parliament, “The towers, turrets, walls… are mostly of great antiquity and by reason thereof are becoming ruinous… and cannot be repaired, maintained, kept up and preserved in good order, but at a great annual charge and expense and more than the said mayor and commonality are able to sustain and pay.” But, partly due to opposition from the Archbishop, Parliament was not minded to act. Meanwhile, the Corporation was knocking down little bits of wall and barbican ‘on the quiet’. This they managed to do in St Leonard’s Place, where the walls were already in a very bad state of repair; and they replaced it with something that looks remarkably like a Bath crescent. 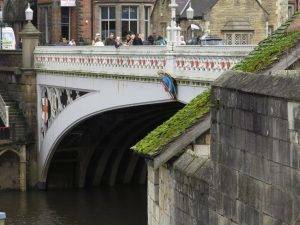 But they got more than they bargained for when they knocked down a stretch of the wall just to the west of Skeldergate Bridge – to their dismay, The Archbishop of York successfully sued them. 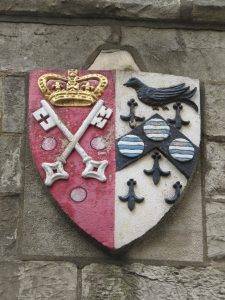 Now whether the church was principally motivated by the desire to maintain the city’s antiquities, or whether they had one eye on the considerable levies that the diocese received at the ‘toll bars’, we will probably never know. This event turned out to be a catalyst for a campaign to save the Walls and create a public path along them, which crystallised in 1825 with the founding of ‘The Association for the Protection of Ancient Footpaths in the vicinity of York’, a forerunner to the campaigning national Ramblers Group (of which I am a proud member; and no, I don’t have a beard). This group set about raising money and restoring sections of the wall. The townsfolk, however, had decidedly mixed opinions, as did the local press, many feeling that their lives were made more difficult by living in a walled city. You could say it was a battle between the romantics and the rationalists, which the romantics eventually won. By the 1830s the Corporation had given up on the goal of total removal and instead decided to dismantle the barbicans (which were especially constricting of traffic) but repair much of the wall. With the onset of mass visitors by rail, the value of the walls as a tourist attraction was quickly becoming apparent. There were various other transgressions in the following decades, most notably the not to be thwarted George Hudson cutting two archways through the walls to allow access to his railway station in 1842. But by the 1880s, the city’s leaders had a very different problem. They had repaired and restored almost all of the Walls but they couldn’t complete the circuit because in the north corner people with interesting ruins at the bottom of their private gardens did not want their romantic garden feature transformed into a newly repaired wall, certainly not into a wall with a walkway from which the public could stare down into their once-private gardens. 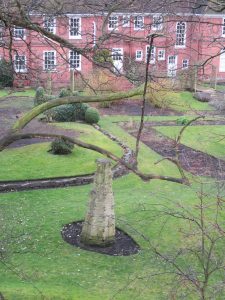 One of the gardens belonged to the Dean and another to Edwin Gray who was the son of a Lord Mayor and was a lawyer; he said he would sue the city leaders for trespass if they tried to touch ‘his’ walls. However, somehow by 1887, a deal was done, the walls were fully restored to a good state of repair, and a public footpath was finally established along them. 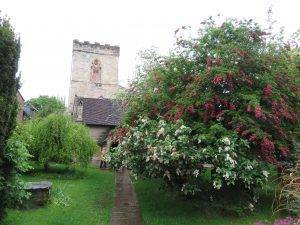 Today the walls are a Scheduled Ancient Monument and a Grade 1 listed building. 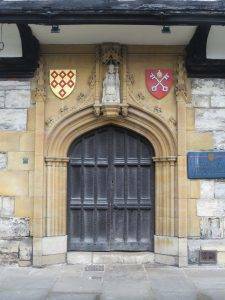 Although much of Bootham Bar was built in the 14th and 15th centuries, it also has some of the oldest surviving stonework, dating back to the 11th century. But we aren’t ready to go up on the walls yet; first, we want to explore some of the medieval city within. 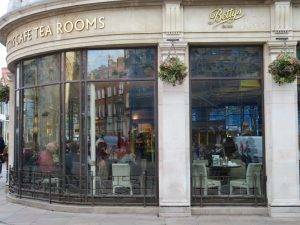 We go through the bar and slip down left along Precentor’s Court, named after the person in charge of music in a cathedral. 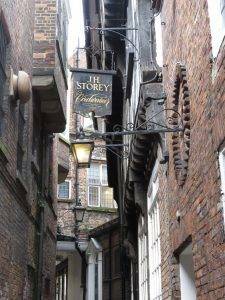 As Mark Jones, author of ‘A Walk Around the Snickelways of York’ so eloquently puts it, “this covered passageway suddenly wraps us in a mantle of tranquillity”. 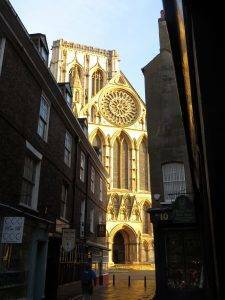 As we approach the end of the lane, so we are granted an amazing view of the west end of the York Minster, soaring majestically above us. Wow, we have truly arrived in York! Emerging from Precentor’s Court, the full splendour of York Minster is in front of us: As Richard Carr-Archer observes, “the Minster is much more than the largest building in the city, the largest cathedral by area north of the Alps, a beacon for the surrounding Yorkshire countryside, and the destination for hundreds of thousands of tourists each year. 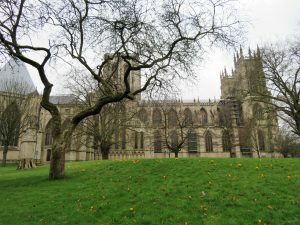 It has numerous other claims to fame: it is the most consistent and complete story of Gothic styles in England (with its many special features, such as the octagonal Chapter House without a middle pier, and the Great West Door, whose recent renewal is one of the finest cathedral stonework achievements of the last century). The medieval stained glass is of the very highest quality: the Great East Window (John Thornton, 1405-8) is one of the most remarkable in the world with its stonework exhibiting one of the earliest extant examples of perpendicular double mullion (and bridged) windows and integrated panelwork around it; the stained glass in the flowing tracery of the 1338 Great West Window enlightens the interior with wondrous luminosity.” It would not be possible to spend too much time exploring and enjoying, but for us, that will be for another day. Next up is the Treasurer’s House (early 17th C), now a National Trust property. 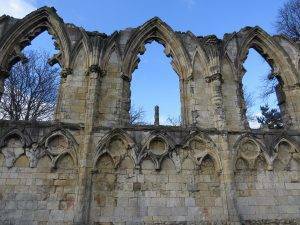 The first Treasurer for York Minster was appointed in 1091, but all that remains of his original house is an external wall. The Treasurer was the controller of the finances of the Minster, this is where they would have made decisions about the bar levies. The treasurer also entertained important guests, hence the grandness of the residence. Then perhaps pause on College Green and put your feet up for five minutes. This tranquil space isn’t quite as ancient as it appears and is an interesting example of the ups and downs of urban space. 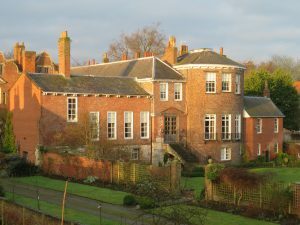 Two houses and their gardens were removed on the north-east side to first create the green in the mid-nineteenth century; it was then extended further to its current size in 1955. But there was a setback in 1903, as Deangate was knocked through from Goodramgate to Minster Yard to relieve traffic congestion. This maybe wasn’t too bad when the traffic was carts & carriages and the odd Rolls-Royce, but by the 1970s it was a traffic-ridden route that detracted greatly from the Minster. Finally, in 1990, after a long campaign by the York Civic Society, it was closed to traffic and is now a very pleasant walkway. Compare that with Worcester, where a dual carriageway still trundles within fifty yards of that great cathedral. It’s worth a little peer into the Stoneyard Works Department if the door within the gate is open. 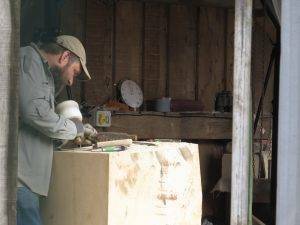 It houses a range of skilled craftsmen and women looking after the cathedral and its precinct properties. 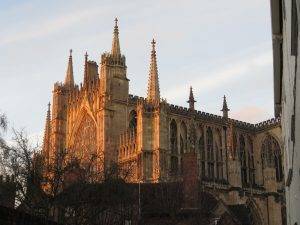 These include stonemasons and carvers, joiners, electricians, scaffolders and gardeners, a team of 80 or so, all essential to the smooth and efficient maintenance of these beautiful buildings. 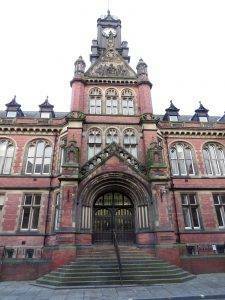 On the annual Heritage Open Days in September, you can get a guided tour. Stonegate, which we wander down next, was the route that the stone was dragged up from the barges on the river to build the Minster. It is estimated that 20,000 tons of it were needed for the central tower alone. You imagine that Stonegate has always been crowded and hard to navigate, first due to the mass transportations of stone, then in the 20th century by vehicles until the route was pedestrianised in 1974, and then increasingly in the last generation by hordes of tourists. We are passing fairly early on a February weekday, and still we are drowned in a sea of people flooding in the opposite direction towards the Minster. 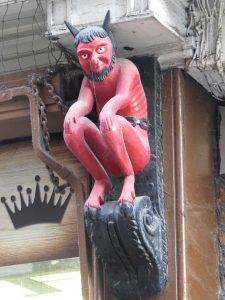 We couldn’t really miss the rather small opening to Coffee Yard, as it is marked by a Red Devil, the traditional symbol of a printer; it was in this alley, in the eighteenth century, that the eccentric writer and publisher Thomas Gent had his printing premises. 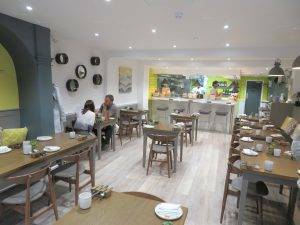 Mark Jones writes: “Coffee Yard is the very quintessence of the Snickelways. It has virtually everything! 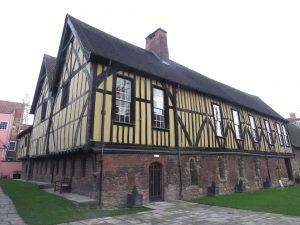 Barley Hall is a medieval house, dating from about 1360, once home to the Priors of Nostell and the Mayor of York. Until the 1980s the house was hidden under the relatively modern facade of a derelict office block. Only when the building was going to be destroyed was the medieval building discovered and its history uncovered. It has been decorated to replicate what it would have looked like as the Snawsell home around 1483 and boasts a magnificent Great Hall. 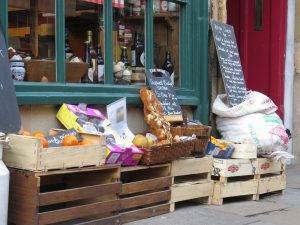 There has been a Thursday market in St Sampson’s Square since at least the fifteenth century – and the numerous alleyways in all directions are the short-cuts that people took to get to the market. 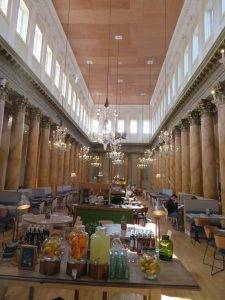 If you need refreshment at this point, pop into the Roman Baths Pub on your left for a quick drink; you can also pop down to the basement to see the preserved Roman Baths underneath, but it’s expensive admission for a very quick look. St Helen’s Square was the graveyard of the church. In 1729 the vicar proposed to York Corporation ‘to cut off part of their churchyard so far as to answer to the opening of Blake Street and to lay it to the street so as a coach may drive with greater ease and conveniency’, which took place once an alternative burial ground was found nearby. What an enlightened decision that turned out to be. The Mansion House (1732), at the south side of the square, is one of York’s signature buildings, still to this day the full-time residence of the Lord Mayor. Then we head along Blake St and for a moment we think we have fallen asleep and woken up in Bath. To our left are the York Assembly Rooms, built by Richard Boyle, 3rd Earl of Burlington in 1730 in a Palladian style with Egyptian influence. In their time, they were full of society balls and gatherings. Today, rather appropriately, they still exhibit an Italian influence in the shape of the Ask Italian restaurant. St Leonard’s Place was built in the early 1800s by the City Corporation to emulate the grand crescents of Bath and London. Apart from number five, which housed The Yorkshire Club (Neville Shute used to write there), and number one, which was York’s first subscription library, the individual properties were leased as shells, leaving the owners to fit them out as they pleased (exactly as happened in Bath too). 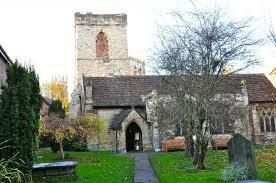 St Leonard’s soon became the hub of elite social life in 19th century York. York Theatre Royal was built in 1744, originally the first building in this very Georgian part of York. 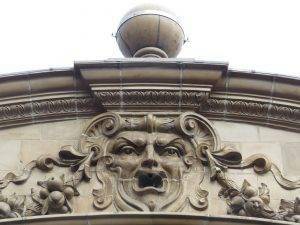 In the 1880s the theatre was given a new Victorian Gothic frontage, decorated with carved heads representing Elizabeth I and characters from Shakespeare’s plays. We enjoyed the ‘tree-canopy’ structure of the modernist foyer (1967) by Patrick Gwynn (echoes of the Dell Restaurant at the eastern end of the Serpentine in Hyde Park which he also designed, on London Inner Ring Stag 3 walk). Three very distinct eras of architecture, the sum greater than the parts. 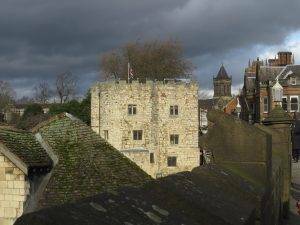 The city walls are the most complete example of medieval city walls still standing in England today. A walk all around the walls is 2.6 miles (4.2 Km). The walls were first built by the Romans out of stone, then buried under an earth bank and topped with a palisade by the Vikings, then rebuilt in stone in the 13th and 14th centuries, then intermittently repaired until the 19th century when they were given a complete make-over to make them more accessible and appealing, with re-built battlements, extra mediaeval ‘features’ and walkways added. Evolution of form and use seems to be so much a feature of York structures. As we climb the steps and cross over the top of the Bootham Bar, so we slip back in time from the Georgian elegance of St Leonard’s Place to an immediate sense of the medieval. This stretch of the walls could have been built purely for the grandstand view they afford of the York Minster. You can see why the Dean and other residents were so reluctant to open this part of the wall up, the privacy of their gardens rendered non-existent with the eyes of a thousand tourists peering down for signs of croquet hoops or garden gnomes. 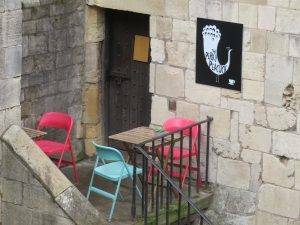 And so, to Monk Bar, the only bar with its original medieval wall and windows surviving on the city side and also the only one where we descend by steep, low-ceilinged internal stairs to get down to street level at Goodramgate. We shortly reach a row of houses on our right, Our Lady’s Row, dating from 1316 and the earliest row of houses surviving in the city. The houses are very simple, made of plastered timber-framing with pantile roofs. Behind these houses, through a charming 18th century arch with wrought iron gates, is Holy Trinity, dating mainly from the 15th century. Our first impression is of a quaint village church that has eloped to the bright lights of the city but doesn’t want to be spotted. Walking into the interior is like stepping back into Georgian times. 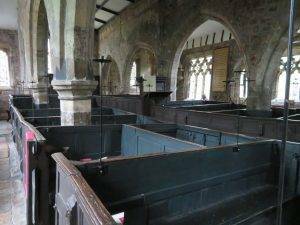 This is the only church in the city to have retained its box pews. Then down our second Hornpot Lane (this one not Nether!!) 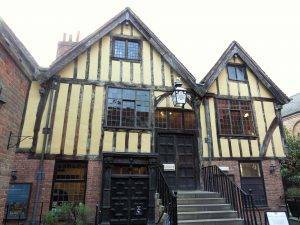 into Lund’s Court or Mad Alice Lane, the name of which is the subject of many different (apocryphal) theories all of which you can find by searching Google. 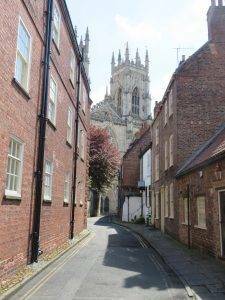 Then we cut left onto Swinegate, past the old St Sampson’s Church and find ourselves in York’s main market, which has traded continuously since the Viking era. 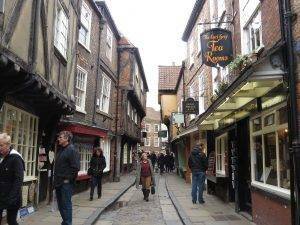 Now, The Shambles is York’s most famous street, which means it is also its busiest (even busier than Stonegate), so if you possibly can then come out-of-hours to get something of the spirit of a medieval street which used to be where the butchers of York sold their meat. The name is thought to derive from ‘Shammel’, an Anglo-Saxon word for the shelves which were a prominent feature of the open shop-fronts. And, yes, ‘what a bloody shambles’ originally referred to the mess at the end of the butchers’ day. At the bottom, but before The Pavement, we turn left into Whip Dog Lane which becomes Whip-ma-whop-ma-gate, York’s shortest street. There are many different explanations offered for the origin of this name, but maybe it’s just a 19th-century outbreak of supercalifragilisticexpialidocious-itis. 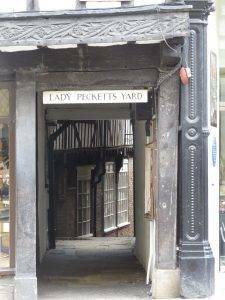 Next up – now don’t say you’re exhausted yet – is the atmospheric Lady Peckett’s Yard. with some of the houses dating back to the 16th century. Coming into Fossgate, we loved the Electric Cinema opposite, York’s first purpose-built cinema, notable for its early fire proof construction technology around the projection room, opened in 1911 and finally closed in 1951. It was commonly known as the Laugh and Scratch. There are surviving oral history accounts mentioning walking on the snap crackle and pop of peanut shells, the playing of piano for horse scenes and a violin for sob stories. It is currently being converted into apartments, with the street front maintained and converted into a coffee shop. 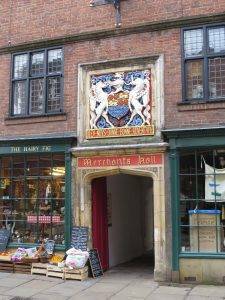 Then we turn right, through an arch with a bright Merchant Adventurers’ Coat of Arms above it, into one of the most important buildings in the medieval city, The Merchant Adventurers’ Hall. 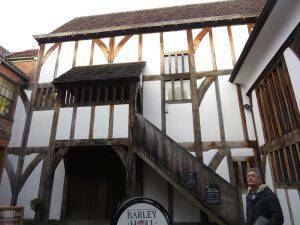 It was built in the 1530s and is the largest timber-framed building in the UK still standing and used for its original purpose. 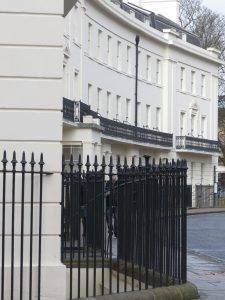 Piccadilly is not a very prepossessing street, you immediately get a sense that it is not a part of the mediaeval street pattern, and indeed research shows it to be a 1911 addition, linking Piccadilly to Pavement and Parliament Street. We scuttle quickly on, along a rather uninviting riverside walk that is poorly maintained, overshadowed on the right by a new shopping development. There are two very notable Georgian buildings in Castlegate, both designed by the Yorkshire architect John Carr (1723-1807). 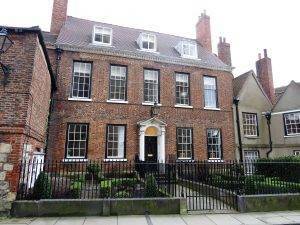 One is Castlegate House, dating from 1759 and built for the City Recorder, Peter Johnson. The other building, on our right, is Fairfax House dating from 1755, which also houses a fine collection of Georgian furniture and other Georgian items known as the Terry Collection. 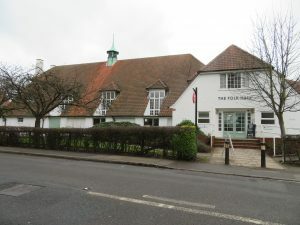 The Friends Meeting House in Friargate was originally built in 1674 and has undergone several redevelopments since then. The 1885 façade, with the entrance in Clifford Street (now called York House), was designed by W H Thorp but is no longer part of the meeting house. The present building (1981), with the entrance in Friargate, is by the Leeds architect Denis Mason Jones. 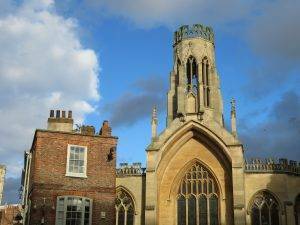 At its height in the nineteenth century, the Meeting House had a gallery and could accommodate up to 1,200 people, reflecting the importance of Quakerism in York. Joseph Rowntree is known to have attended meetings for worship here. 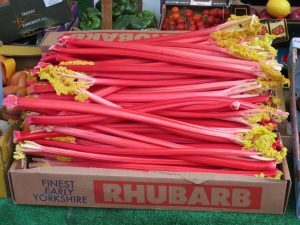 The York Quakers, led by successive generations of Rowntrees, contributed to the shape of Quakerism nationally, being sensitively progressive and taking a stand against more conservative Quakers of the time. 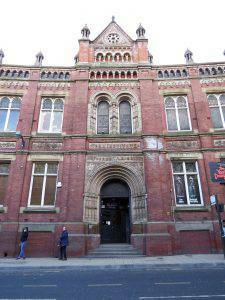 The first building we see directly opposite is the York Institute, a technical college founded in 1827, though actually, this building dates from 1883-85. It taught art, science and literature (admittedly that didn’t take a lot of research to find out, the course offerings are carved on the building). 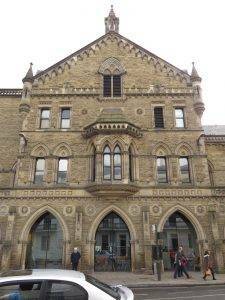 And York Magistrate’s Court is a fabulous piece of 1890s High Gothic, my favourite building of the day so far. 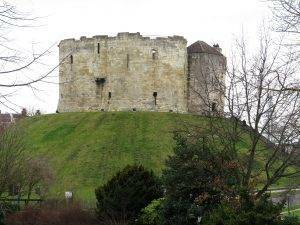 Next, we pass by the Clifford’s Tower, which today is the only bit of the castle surviving. This was the keep of the medieval Norman castle, built originally on the orders of William the Conqueror to dominate the city. 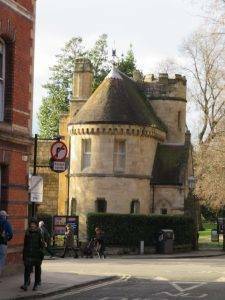 Spread around the ‘Eye of York’, also sometimes called Castle Green, there is a beautiful trio of eighteenth-century buildings. The earliest building chronologically is the Male Debtors’ Prison to the right of the (ugly) entrance to the Castle Museum, built in 1705. 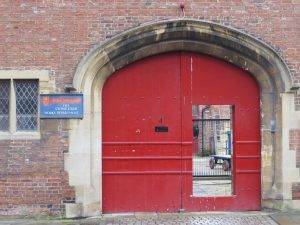 Daniel Defoe described it as, “the most stately and complete prison of any in the Kingdom, if not in Europe, kept as neat within side as it is noble without.” You will immediately see what he means. 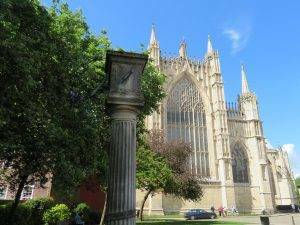 Nikolaus Pevsner says of it, “This building is, next after the Minster, the most monumental of York”. 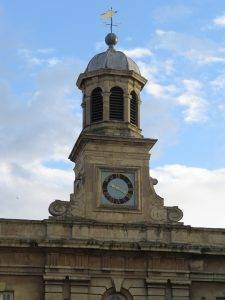 The tower has an unusual clock, with only one hand, installed in 1716 by a York clockmaker, John Terry. The next building, chronologically, is the Crown Courts on the right, built in 1777 by John Carr. Finally, the Female Prison on the left, built in 1780 in a similar style to the Crown Court. And then we head south into St George’s Field, passing the floodgate chart on our right, a stark reminder of just how much York has suffered from flooding throughout the ages. 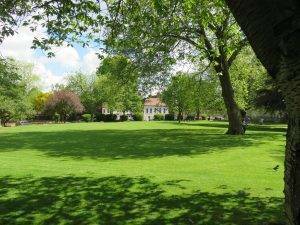 This pleasant green dates back several hundred years and was used both as a place of pleasure and punishment. Charters dating back to the 16th century gave the citizens the right to hold pageants here, play games, dry linen and shoot with bows & arrows. But it was also the site of public hangings and ducking stool punishments. New Walk, which begins on the south side of Skeldergate Bridge, is a tree-lined avenue created in the 1730s for promenading. Its creation was an important part of the attempts made by the eighteenth-century City Corporation to raise York’s status to that of a leading Georgian social centre. The city sought to provide entertainment for the gentry and burgeoning middle classes of the period to enjoy. 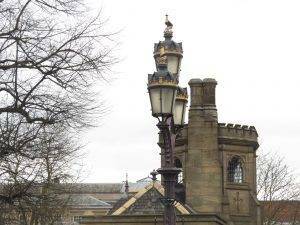 Other important contemporary landmarks included the Assembly Rooms, the Mansion House and the Racecourse. New Walk proved to be extremely popular, being one of only a few such walks in the country and was soon extended further out of the city. Across the Blue Bridge, along the river to The Millennium Bridge, then back through Millennium Park and along Terry Avenue. The original wooden Blue Bridge drawbridge was built in 1738 as a continuation of New Walk. It was painted blue and the colour and name have endured though the bridge itself has been replaced several times, most recently in 1930. Shortly afterwards we passed the Pikeing Well (1752). 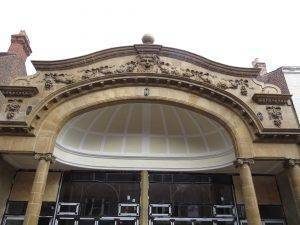 This was one of John Carr’s first commissions, commissioned to add an interesting feature to New Walk. Water from the well was thought to have medicinal qualities, particularly in the treatment of sore eyes. A little further along, just before the new bridge, we noticed the remnants of a miniature railway line coming up from the river and apparently heading straight into a brick wall (an in-fill as it turns out). Further research shows that military stores were unloaded at an Ordnance Wharf, built in 1888, and taken to the army depot in Hospital Fields Road on a narrow gauge railway, this small section of which is still visible. Explosives were brought in the schooner ‘Princess’ known locally as the ‘Powder boat’. The Millennium Bridge opened in April 2001, costing £4.2m and funded by the Lottery, local council and local businesses. The stainless-steel structure’s higher design protects it from flooding and is a pedestrian/cycle bridge only. 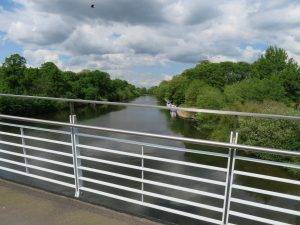 It is a key link in the Sustrans National Cycle Routes and part of York’s orbital route. We found it very used, a great addition to the east of the city. 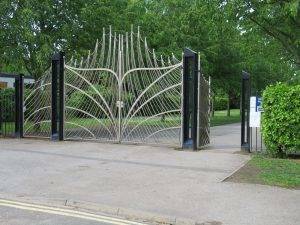 Situated on Terry Avenue is Rowntree Park (10.1 hectares, 25 acres), York’s first municipal park. It was a gift by Joseph Rowntree in 1921 as a memorial to the members of the Cocoa Works’ staff who died in the First World War, to be (in his words) a ‘quiet restful memorial park’, rather than ‘another stone obelisk’. 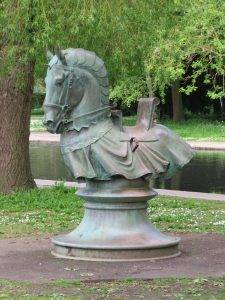 In 2003 a £1.8 million Heritage Lottery-funded refurbishment of the park was completed with many historical features returned to their original condition. It has a very calm and agreeable feeling about it. Skeldergate Bridge was built in 1881 by Thomas Page and, like his Lendal Bridge, is iron with Gothic details. The original design of the bridge was altered during planning to enable the north-easternmost span of the bridge to open, allowing tall ships to reach the busy quaysides further upstream. The bridge was last opened in 1975 and the winding mechanism has since been removed. Now for the final part of our journey we – re-join the wall at Baile Hill. And finally, we make relatively speedy progress as, although there are great views throughout, there are fewer buildings to inspect. Victoria Bar was knocked through the wall in Victorian times to provide better access to this emerging part of the city. It was George Hudson, the railway king, who had helped finance the gate, perhaps testing the mettle of the wall’s defenders prior to other incursions. 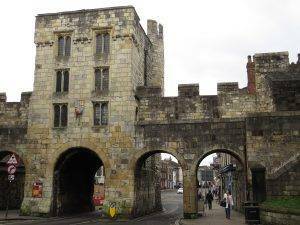 Micklegate Bar was the traditional ceremonial gate for monarchs entering the city, who, in a tradition dating back to Richard II in 1389, touch the state sword when entering the gate. A 12th-century gatehouse was replaced in the 14th century with a heavy portcullis and barbican. Its symbolic value led to traitors’ severed heads being displayed on the defences. 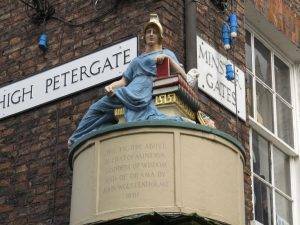 Micklegate itself makes a pleasant excursion and there are numerous cafés/restaurants to enjoy there. Our journey finishes with a grandstand view of York Station and beneath us the two massive archways through the wall that allowed trains to enter the city to reach George Hudson’s original station on Station Rise just in front of the Grand Hotel. Millennium Bridge loop: Continue under the Skeldergate Bridge along New Walk, crossing the Blue Bridge, then continuing S along the E bank of the Ouse, to cross the Millennium Bridge; then heading back through Rowntree Park and then along the W bank of the river along Terry Avenue to reach Bishopgate St, where you re-join the walk. This is an extra 2.4Kms (1.5 miles). On the other side of Skeldergate Bridge, cross Cromwell Rd; and rather amazingly I need to give you no further direction than proceed all the way around the walls until you pass the station below on your left, and you descend back down the stairs that you started the walk at to return to the station. Betty’s Stonegate, 46 Stonegate, York, YO1 8AS (01904 622865, www.bettys.co.uk/tea-rooms/locations/stonegate-york) Cosy café and local institution with an English menu, antique dressers, wooden beams and open fire. Mannion & Co, 1 Blake St, York, YO1 8QJ (01904 631030, www.mannionandco.co.uk) Relaxed rustic-chic café and deli dishing up French and Italian-style food and freshly-baked bread. Skosh York, 98 Micklegate, YO1 6JX (01904 634849, www.skoshyork.co.uk) Skosh means ‘a small amount, a little’…. 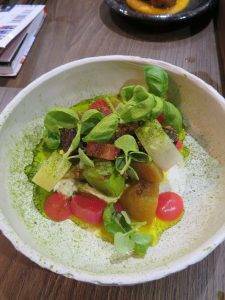 eat as little or as much as you want at this inspirational establishment, each portion is very modest. 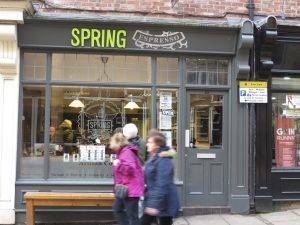 York is a haven for independent shops – just wander around really – with key streets for independents being The Shambles, Fossgate, Stonegate and Gillygate. Yorkshire Museum, Museum Gardens, Museum St, YO1 7FR (01904 687687, www.yorkshiremuseum.org.uk ) Houses four permanent collections, covering biology, geology, archaeology and astronomy. York Art Gallery, Exhibition Square, YO1 7EW (01904 687687, www.yorkartgallery.org.uk) The gallery has the largest collection of works by William Etty. National Railway Museum, Leeman Rd, YO26 4XJ (0844 815 3139, www.nrm.org.uk) You should make the time to go even if you are only vaguely interested in railways. The Mallard steam engine is a work of art deco art. Don’t look round without: The very detailed (1:3,5000) York City Centre map by Andrew Taylor, generally available in the Tourist Office and in Waterstone’s. Read: One of the finest walking books that you will ever own, ‘A walk around the Snickelways of York’, by Mark W. Jones, again available in the Tourist Office and in Waterstone’s. It is the Wainwright of York’s Snickleways… I went into the Tourist information in search of stuff and they immediately saw my mad urban rambler look and pointed me to this absolute gem of a book. 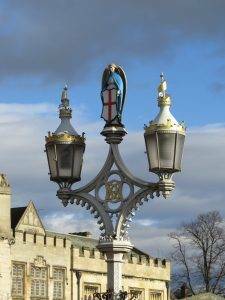 Read: ‘A Walking Guide to York’s City walls’, the definitive Book of the walls walk. Visit: New Earswick (3 miles N of the city centre), a 1902 Rowntree-inspired community. 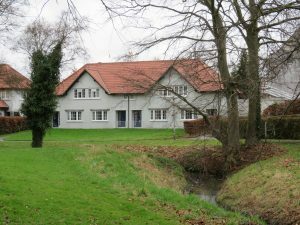 It’s a lesson that lots of little things in combination – more spaciousness, garages at the back, front gardens, hedges, public halls and generous green spaces – make a profound difference, maintaining a strong sense of community.